Having read all of the “Sherlock Holmes” stories, Jeremy Brett and the different adaptations of said stories or how I imagine them to be (except for how they present Moriarty). Watson looks like Watson, Holmes looks and acts like Holmes and the mysteries are very much of their eras and haven’t been adapted or embellished in anyway. Granada did a masterful job on this series and the pilot “A Scandal in Bohemia” though there are limitations in regards to the filming and a few other things that I’ll get into further into the review. The episode was directed by Paul Annett and written by John Hawkesworth. 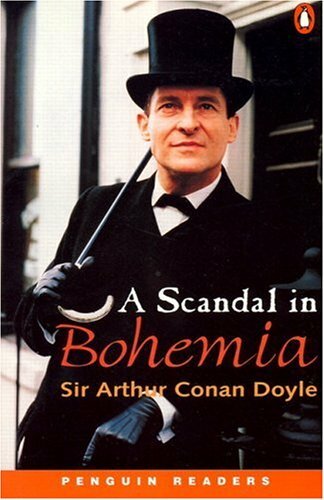 The story involves the King of Bohemia trying to steal back a questionable picture of him and Irene Adler so he hires Sherlock Holmes in order to do so. They soon realize that tricking Irene will not be so easy though. The Pros: The Setting – I like Victorian England. It’s beautiful and the carriages and dark create an heir of mystery that helps offset the poor pacing and filming of the film. Irene Adler – Gayle Hunnicutt plays a very honorable Irene Adler who doesn’t play those around her, she is genuine in her love and affection and a woman trying to take care of herself in a world where she has very little power. She only holds onto the picture because she wants to marry the man she is set too and it is a way to make sure she is left alone. She shows great admiration and respect for Sherlock too and realizes it’s him (sees behind his disguise) before he realizes she has…she also leaves him a photo, showing how much she enjoyed the battle of wills. What an awesome version of the character and shows the Adler of the books who beat Sherlock and forced Sherlock to change his sexist views. Watson’s Narration – Watson’s narration is great as it shows just how great the adaptation is and capturing the fact that it was adapted from stories within a book, that in universe were written from Watson’s point of view. Sherlock Holmes – Brett is Sherlock Holmes. He captures it more than any of the others as he is master of disguise, a gentlemen, an addict who needs stimulation as his greatest threat is boredom and one who is all about the case when he’s on it and the stimulation he gets from it. Jeremy Brett is Sherlock Holmes. Okay: Dr. Watson – Watson’s performance isn’t memorable but David Burke looks the part and he isn’t bad…but there is nothing that sets him apart or truly memorable in the role. The Minor Characters – Much like how the minor characters in Sherlock Holmes usually didn’t get much exploration as the focus is mostly on Sherlock, the same goes here. They were just kind of present to be part of Sherlock’s plan. The Cons; The King of Bohemia – The King is just a King and there is nothing memorable in the actor’s performance. He could have been played by anyone, which is a shame as there is a lot that could have been done as a King pretending to be someone else and dealing with his own hypocrisy when he hurt Irene. Pacing – Part of this is how it is filmed, where there aren’t any unique shots but it drives down the pacing of the episode, which is a shame as Jeremy Brett and Gayle Hunnicutt are so on their roles that they shine in the dull pacing and filming. This was a good adaptation, though there were things that kept it from being great. These things were pacing issues, an unimaginative Watson and the very bland cinematography. These were the things that kept it from being great, ,though it was still good due to Gayle’s performance as Adler and Brett’s performance as Holmes. If you enjoy the books, check out the Granada series.